There's an interesting topic being discussed on The Online Photographer website at the moment concerning one of Mike Johnston's print offers. 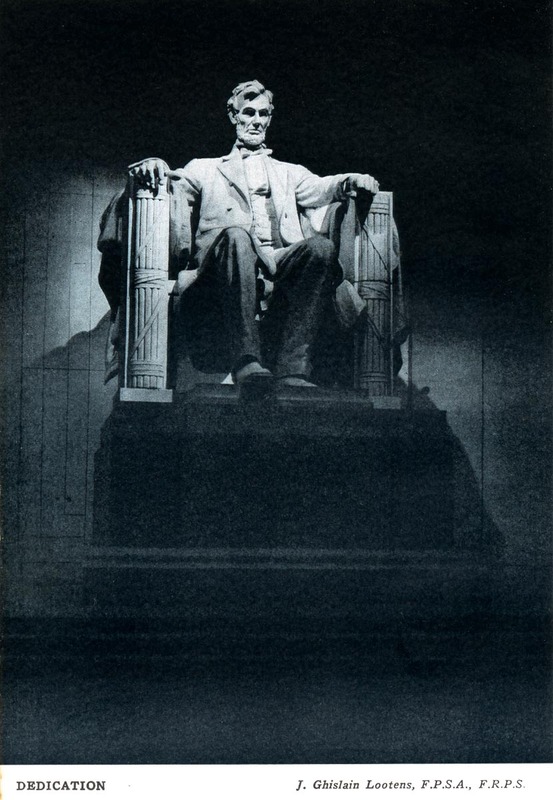 It's a pic of the Lincoln Memorial in Washington D.C. taken by photographer David Dyer-Bennet in 1975 with, from David's memory, a Pentax Spotmatic. I much prefer the original as well. The before pic does a much better job of capturing the scale of the monument and the addition of the ropes, the stairs and the step ladders in the background all add to the image, particularly in giving it a sense of context which is much-needed when it features a couple of workmen steam cleaning it. Some perspective correction has also made the final print looked skewed and a bit weird. I don't think either one is anything special as a photograph, to be honest. The memorial was dedicated in 1922 and has long been a favourite subject for photographers. Consequently, there are a huge number of images of it making it something of a hackneyed subject. If you do a Google search for "Lincoln Memorial" you'll find loads of pics many of which I would rate more highly than the TOP sale print. David's one is a little different because of the inclusion of the workers but it doesn't set my pulse racing. It's a nice image but I wouldn't put it any higher than that. What do you think? How much more impressive is the photograph at the top of this post by Joe Lootens, a Belgian who made his home in the US. It was taken in the early 1940s, I think, or possibly earlier when the memorial would have been far less familiar to the public. Lootens's blue-toned black and white print captures a sense of grandeur in a way that Dyer-Bennet's inkjet doesn't. As I understand it, Lootens isn't particularly well known even in the US. I have his book Lootens on Photographic Enlarging and Print Quality and it remains a favourite. My edition is from 1953, seven years after Lootens was found dead on holiday at the age of just 43. Here's a cutting from the August 22, 1946, edition of the New York Post showing his obituary. I only know his work from the book I have and it was decent stuff but a little old-fashioned by today's standards. However, no excuses need be made for "Dedication", a striking and fitting memorial to the 16th US President. I'm not aware I've deleted any comments in your name, Antonio. In fact the only comments I've deleted have been left anonymously. I was getting so many anonymous spam messages that I just started deleting them as a matter of course but only after I warned that this was what I intended doing. So if you're posting in your own name, contribute away! I can see it now. Some geeks look at historical photographs, and through many hours of digital manipulation, they think they can "improve" them. Can you imagine Robert Capa's famous but "flawed" D Day photograph altered to show none of the motion blur or other artifacts of photographing in such desperate circumstances. i, too, read some of the debate over at TOP, and had some thoughts about the whole thing, but couldn't be bothered to jump in the sharks. like you, i don't appreciate this photograph to much, and if i were to stand there at that exact moment i would do other choices with the scene. i think the biggest and most important issue of the digital era is about post-processing. the photography community has to go through a phase of adolescence and get over the false notion that optimizing is what an image need. as a professional photo-retoucher i can read the retoucher's mind when he did the job on this photo. i do things like that everyday on almost all the photos i work on. and i hate everything about it! the digital tools available today are about a million percent over qualified when it comes to processing a photo. a good image doesn't need any fine tune except brightness and contrast (both general and local)for it to shine through. the debate at TOP offer a glimpse at the "uncanny valley" like feeling and reaction people are getting from digitally enhanced photographs. it's a feeling most of us still can't articulate, but know it's there. hope to see debates like that spread in the future. Hopefully you'll make the right decision and plump for film! I think Mike Johnston is the best writer on photography by some distance but he's been at it a long time and it's difficult to keep coming up with genuinely new and interesting stuff. Some of his earlier writing for the Luminous Landscape, as you no doubt know, was really excellent. Over the last few years I think he's been increasingly concentrating on the financial side of blogging - nothing at all wrong with that: he has to make a living - but it has come at the expense of the more creative side of things. Still, he's done a great job with his website and hopefully he'll keep at it for years to come. I just wish he would write more about film and darkroom work a little more. He built a darkroom not too long ago but he never seemed to get back to that side of things at all really. I drop by TOP 2-3 times a week, as I have fond memories of MJ's writing for Black and White Photography (once upon a time), so I'm familiar with this print sale. I thought the offered image was interesting, until I saw the original unprocessed version. A photograph which started life as a 35mm Grab shot has been morphed into something else. The perspective correction, expanded tonal range etc is almost like trying to turn it into a posed, Large Format image. Over the years I've moved from 35mm to 6x6, now largely 5x4. This print sale makes me feel I'm seeing a photographer try to re-write his own personal creative history. These days I hardly shoot 35mm (I just enjoy 6x6 and 5x4 more) but I don't feel like I want to back and somehow change the photos I did take in that format. There's a spontaneity and (inviting disagreement) truthfulness to small camera, hand-held shooting. 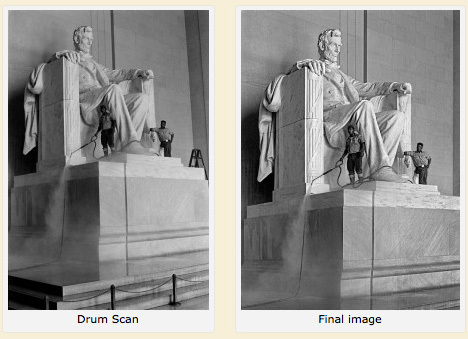 The editing of the Lincoln Memorial image undermines all that. Remove the ropes, the ladders, change the tones and perspective . . .
What are we really now looking at?